John G. Polzin was born in Chicago, Illinois on May 15, 1922. His family settled in Kalamazoo, and he was educated in the Kalamazoo Public School System, graduated from Kalamazoo College and over the years attended a number of post-graduate sessions on food technology. He developed an expertise as a Flavor Chemist, which led him into eminence in a restricted field. He serves as President of National Products Co., which specializes in the manufacturing of a variety of flavoring essences used in the baking, ice cream and confectionary industries. Because of his trade activities he became part of several professional and trade associations affiliated with the products of his company. Professionally, he is a flavor chemist. With his father’s help, he founded National Flavor Products in 1942. He continued to head the company after his father’s death in 1972. The company has changed into an employee owned and managed corporation. He continues with the company as a member of the Board of Directors and heads up Research and Development of Flavors. He is also a member of the U.S. Chamber of Commerce. He enlisted in the U.S. Army and reached the rank of Sergeant. He served as a member of the Ordnance Division of the Third Army, serving under General George S. Patton in the European Theatre of Operations. He married Kathryn Stimson on December 29, 1956. He has been very active in almost every conceivable civic, social and charitable field in the Kalamazoo Community. He is a Rotary Club member, active for United Way, Red Cross, Project HOPE, and Director of the Kalamazoo Society for Crippled Children, a YMCA member and a former director of the Kalamazoo Civic Players. He was raised as a Master Mason on March 25, 1953 in the Anchor Lodge of Strict Observance No. 87. Becoming immediately active he had the privilege and pleasure to serve as Worshipful Master in 1960. He was accepted for membership in Kalamazoo Chapter No. 13, R.A.M. ; Kalamazoo Council No. 63, R. & S.M. ; Peninsular Commandery No. 8, K.T., serving as Eminent Commander in 1969; Scottish Rite Bodies, Valley of Grand Rapids and Most Wise Master of Robinson Chapter of Rose Croix in 1966-67. He holds a membership in St. Vincent Conclave, Red Cross of Constantine; Royal Order of Scotland, Thistle and Rose Council A.M.D. (Senior Warden); Saladin Temple Shrine A.A.O.N.M.S. ; Royal Order of Jesters. For services rendered the Craft during 25 years of intensive activity he was Coroneted a 33° Mason on September 30, 1970 thus becoming an honorary member of the Northern Supreme Council. His is also a Legion of Honor recipient of the International Order of DeMolay and holds honorary membership in a number of Michigan Lodges. 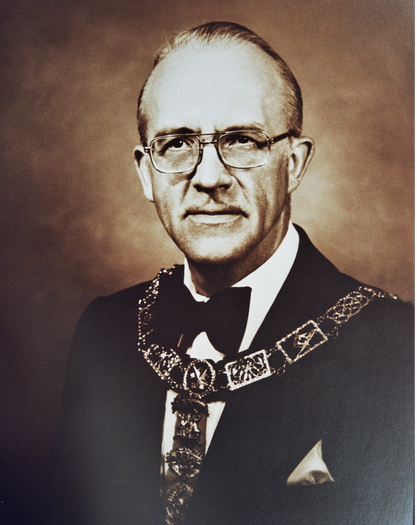 He was elected as Worshipful Grand Marshal in May of 1969 and advanced in office each year until his election as Most Worshipful Grand Master on May 29, 1975. John: This is a very nice article and very well deserved.